In Bangkok you’ll find a lot of restaurants that serve Isaan food (northeastern Thailand). 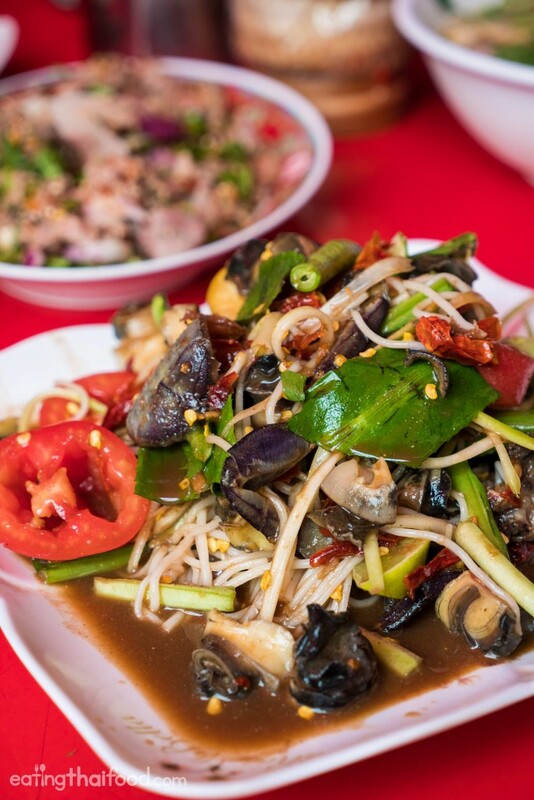 And while there are many great Isaan restaurants in the city, there are many that lack the same crazy bursts of flavor that you find in the salads and dishes actually within Isaan (or Laos). Being a huge fan of som tam (versions of green papaya salad), I’m always on the look out for delicious som tam. Som Tam Jay So (ร้านส้มตำเจ๊โส) is a restaurant that serves green papaya salad almost exactly the way you’ll find it in Isaan. And if you love som tam in its rawest and most pungent spicy form, this is a restaurant in Bangkok you’re going to love. Som Tam Jay So (ร้านส้มตำเจ๊โส) is a very popular Isaan restaurant located right in the downtown business district of Silom, in Bangkok. If you go at the peak of lunch on a weekday, expect it to be packed out – and big groups of office workers also often call ahead to reserve tables. So if possible, try to show up a little before lunch, at about 10:30 am or 11 am to get a table quickly. The restaurant looks like little more than the front of a garage from the outside, but they have a few tables set up outside on the street, plus a section inside the patio, and then more tables set up inside the parking lot of the house. At the front of Som Tam Jay So (ร้านส้มตำเจ๊โส) you’ll see the green papaya salad ingredients on the left side, where they prepare all the salads, and a cabinet full of grilled meat and an assortment of pots that include soup broth on the right hand side. The owners are all very friendly, and it’s one of those restaurants in Bangkok that even though you’re right in the middle of downtown, you’re down a quiet relaxing side street. 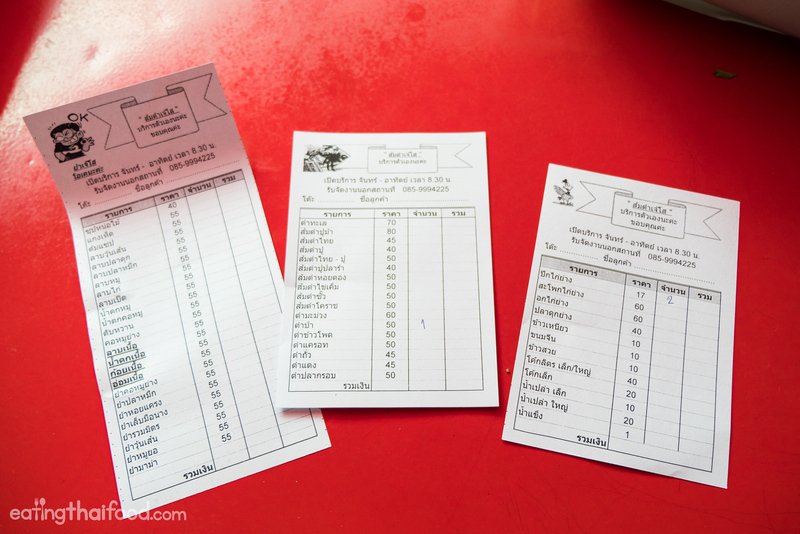 I didn’t notice any English menu, and the Thai menu is written in checklist form, so you can just go through the list and check the dishes you want. But you can alternatively just tell them the dishes you want, and they will be happy to help you out and take your order. My wife and I started off with the tam pa (ตำป่า), a type of green papaya salad that literally translates to jungle pounded and it includes a pretty random mixture of all sorts of pungent ingredients. 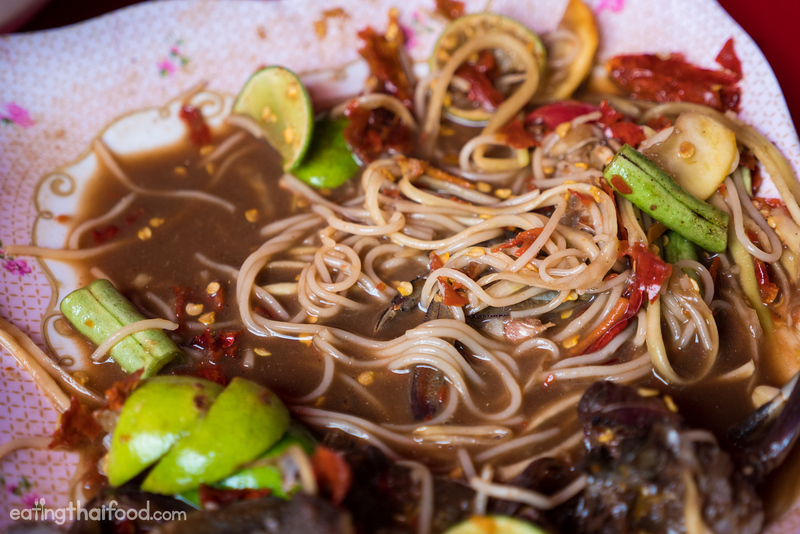 As soon as our plate of tam pa (ตำป่า) arrived, with full dry red chilies popping out, rough cut herbs, and with a dark murky fermented fish sauce (pla ra) dressing I knew I was in for the real deal. The tam pa (ตำป่า) was as fiery spicy as it looked, and she used mainly dry chilies, giving the salad a fragrant chili taste along with being crazily spicy. 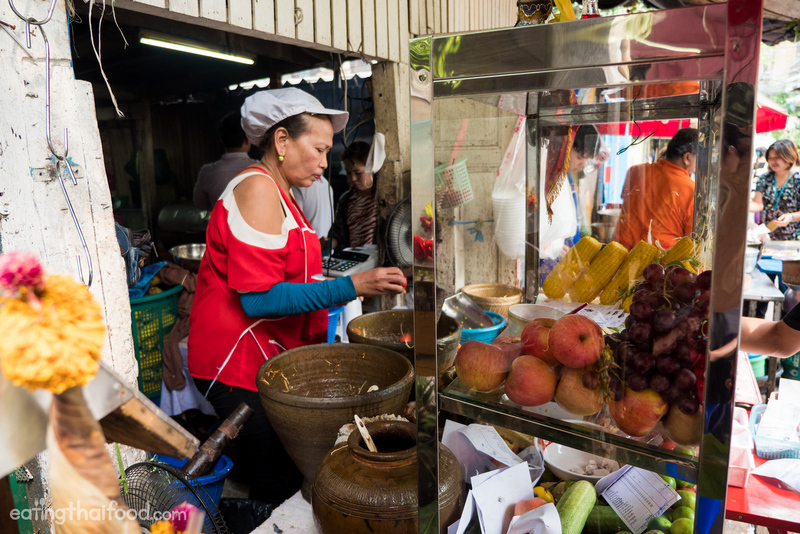 In the mix there were also shreds of green papaya, tomatoes, culantro, crab, and pieces of chopped up what in Thai are called hoy cherry (หอยเชอรี่) – a type of freshwater channeled apple-snail. The tam pa (ตำป่า) was pungent from the fermented fish sauce, yet it still had a wonderful freshness to it, with a diverse spectrum of textures going on. It was one of the best I’ve had in Bangkok. Another green papaya salad we ordered was som tam sua (ส้มตำซั่ว), green papaya salad with fermented fish sauce and crab and khanom jeen rice noodles pounded into the salad. 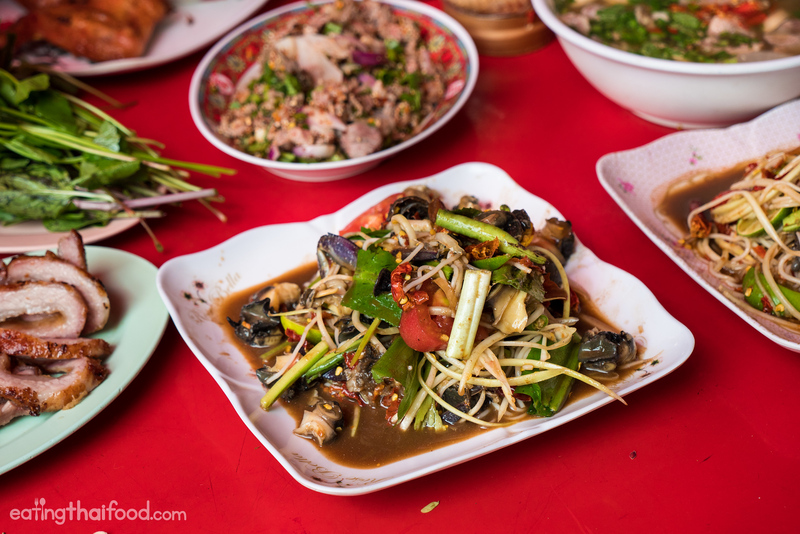 It had similar dressing ingredients as the tam pa (ตำป่า), with pungent fermented fish dressing and lime juice, just less of the random jungle ingredients, specifically the apple-snails. Although fermented fish sauce being fresh is quite ironic, the plate of som tam sua (ส้มตำซั่ว) was refreshing, and a true roller coaster of excitement to the taste buds. 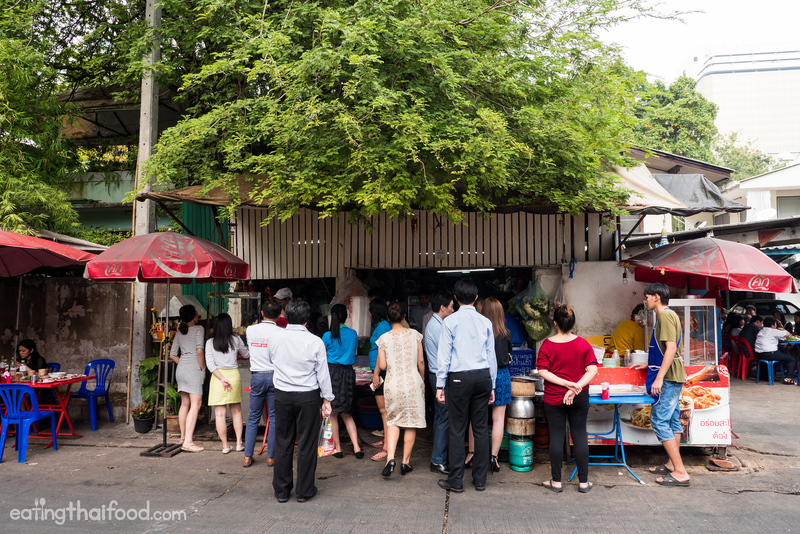 My wife Ying and I were both so satisfied with the som tam at Som Tam Jay So (ร้านส้มตำเจ๊โส) that we sat there in silence, slightly crying from the chilies, and thoroughly enjoying every bite – like we were back in Isaan. 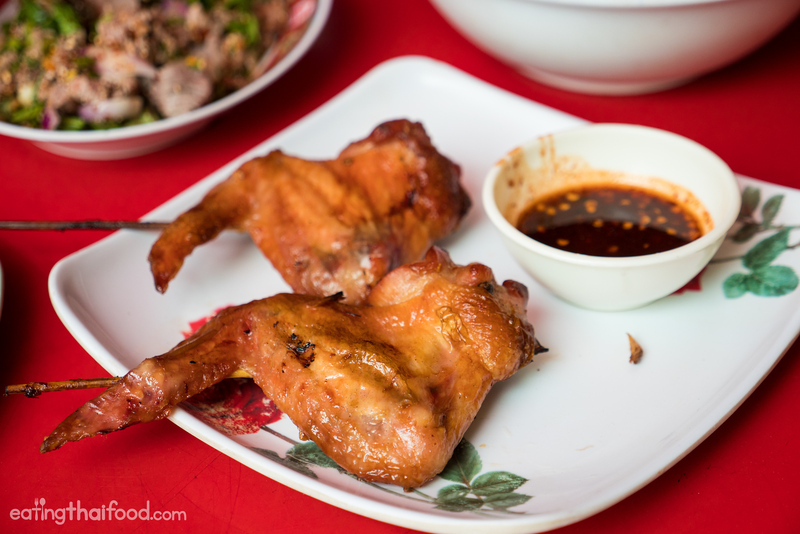 Another thing that you’ll see just about everyone who is eating at Som Tam Jay So (ร้านส้มตำเจ๊โส) order is the pik gai yang (ปีกไก่ย่าง), grilled chicken wings. When they delivered them to our table, they were so golden brown and looked so crispy on the outside, that I would have guessed they were deep fried, but they were indeed grilled. The wings were marinated in a salty and slightly sweet marinade, and they must have marinated for a long time because the flavor penetrated all they way through the meat to the bone. They were good with some sticky rice and bites of the pungent salads. 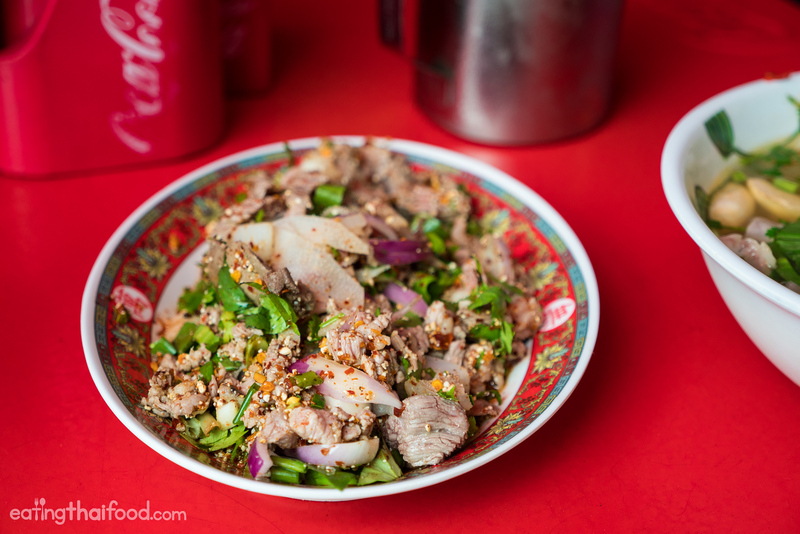 Additionally, I decided to try their laab neua (ลาบเนื้อ), an Isaan meat salad, this time made with beef. The laab neua (ลาบเนื้อ) came with hand chopped up bits of beef, some bite sized pieces, others more minced pieces, mixed with plenty of cilantro and green onions, shallots, dry chili flakes, and a good amount of fresh tasting khao khua (roasted rice powder). It was a pretty decent plate of laab neua (ลาบเนื้อ), and it was the style I like, with lots of roasted rice powder to give it a smoky taste and crunchy texture, and lots of herbs. 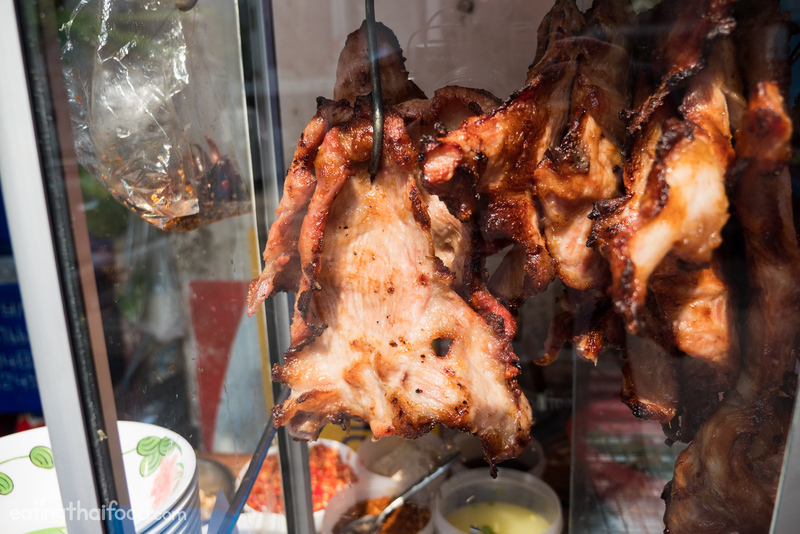 I wasn’t planning to eat kaw moo yang (คอหมูย่าง), grilled pork neck at Som Tam Jay So (ร้านส้มตำเจ๊โส), but when I saw the cabinet filled with slabs of grilled pork neck, juices dripping, there was no way I could resist. 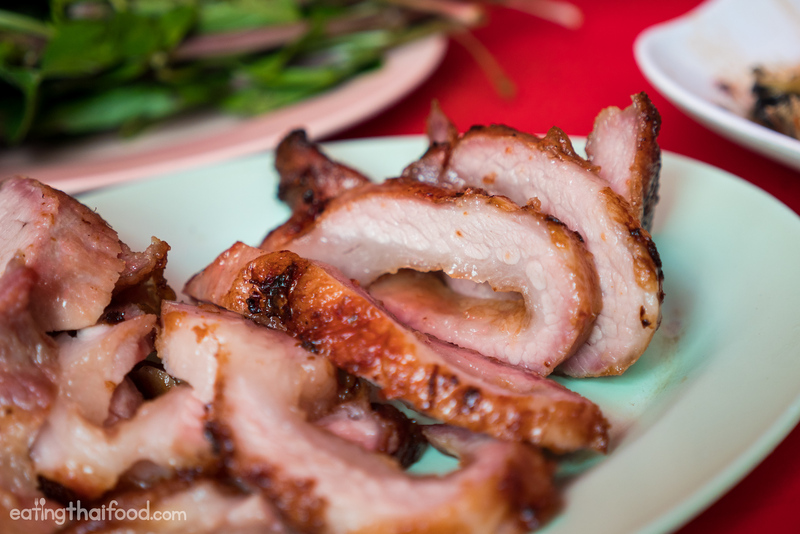 Sometimes when you eat Isaan street food in Bangkok, they don’t actually use the real pork neck, but use a cheaper cut that’s just fatty and not as good. But I believe from the marbling of the meat, that they were using real pork neck meat. She removed a big piece from the glass cabinet, sliced it up, and put it on a plate, served with a sweet chili dipping sauce. The kaw moo yang (คอหมูย่าง) was unbelievably juicy, and flavorful, and while it was fatty of course, it was well worth it. 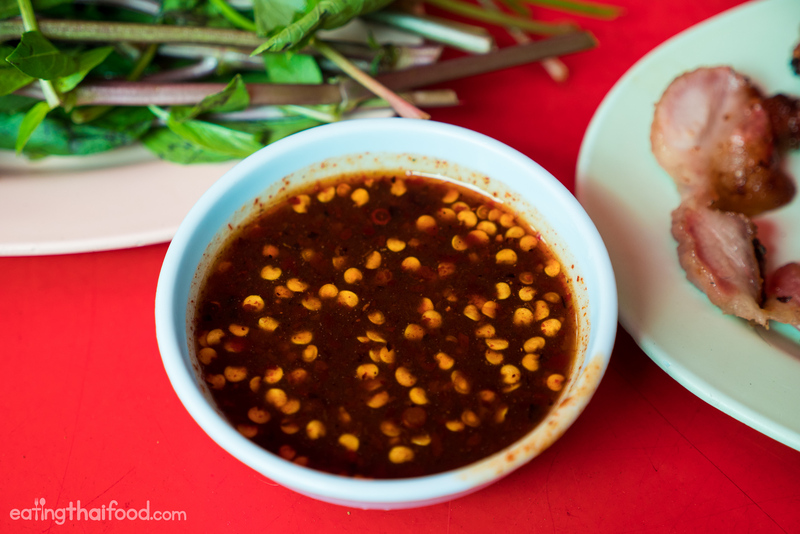 I wasn’t a huge fan of their nam jim jaew (chili dipping sauce) as it was of the sweet tamarind variety I believe – I would have liked it better had it just been a simple mixture of fish sauce, dry chili flakes, and roasted rice powder. However, it was still excellent, and that pork was ridiculously tender. Finally, to finish off our Isaan food lunch in Silom, Ying and I ordered a bowl of tom saeb moo (ต้มแซ่บหมู), the common Isaan soup. The soup, which was prepared from a slow boiling pot of bones and parts, included lots of intestines, and a mild yet soothing porky broth. I liked how she dished it out, then added in a scoop of fresh pounded chilies and cilantro to the bowl to give it some extra flavor. Som Tam Jay So (ร้านส้มตำเจ๊โส) is a local Isaan restaurant in the Silom area of Bangkok, that I think serves some of the best som tam (green papaya salad) in the city. 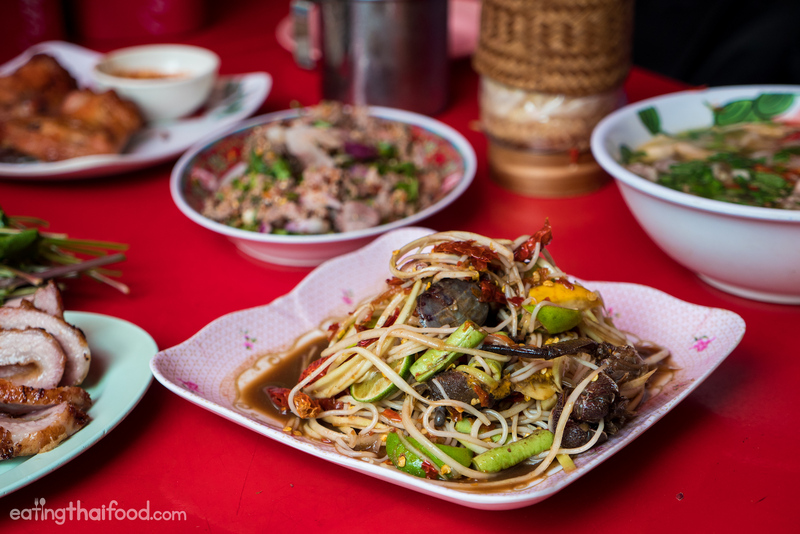 Their different versions of green papaya salad are outstanding, fiery hot, pungent with fermented fish sauce, and overall just thrilling to the taste buds. 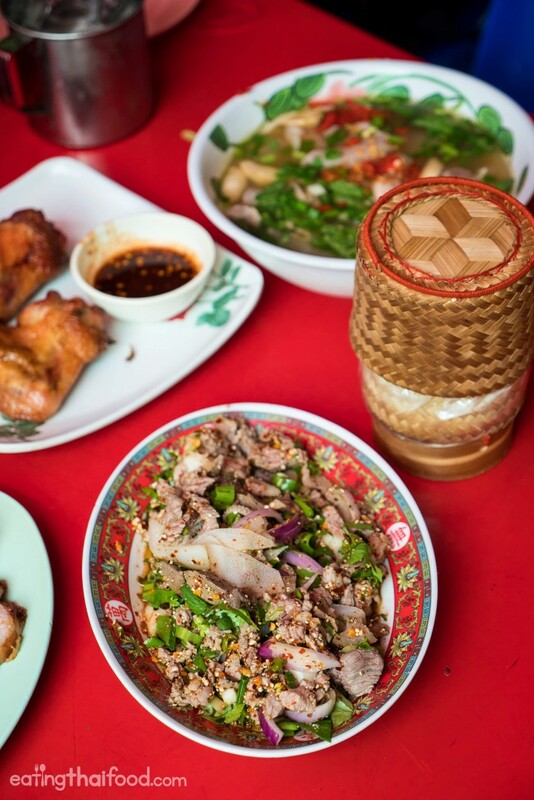 They also serve an assortment of other Isaan dishes, especially excellent chicken wings and grilled pork neck. For myself, eating som tam at Som Tam Jay So (ร้านส้มตำเจ๊โส) is about as close as you can get to eating in Isaan while still being in Bangkok. เปิดบริการทุกวัน 8.30 – 16.30 น. How to get there: Som Tam Jay So (ร้านส้มตำเจ๊โส) is located on Soi Phiphat 2, right off Soi Convent in Silom. It’s just a 5 minute walk from Sala Daeng BTS station. I stayed at a hotel next door, so ate there lots of times. The staff all speak a little English, I found them both friendly and welcoming. If you don’t know the Thai names just show them pictures off Google/Tripadvisor/whatever, and ask for Thai spicy so they don’t give you the tourist version. I love their fruit and corn salad, the chicken wings are amazing, and so is their laab mo and grilled fish. They feed all the street cats outside the leftover fish and chicken from the restaurant, and have adopted two adorable kittens for the shop, one completely blind. Great recommendation for those who don’t use the Thai names yet for these dishes. Thanks for reading! Hi Mark, I’ve been looking up some of the places you’ve recommended & are excited to try some new places (my third time back in Bangkok). But, when I google these spots to save them, the open times vary from the information you have available? Are street stalls typically open in the morning, or not anymore? Just curious if I should actually be following Google’s listed hours. Thanks! Tried to eat at this restaurant, it was very busy and the looked really good. Unfortunately nobody spoke any English at all. I could not order from the menu as it was in Thai. I sat at a table for 15-20 minutes waiting and hoping they would serve me but I didn’t feel very welcome there so I gave up as they were too busy with to help me. Oh well I’m sure the food is great but I think it’s meant for Thai people not very friendly to visiting Farang. Hi Mark, I will be traveling in Thailand for the 2nd time next week. 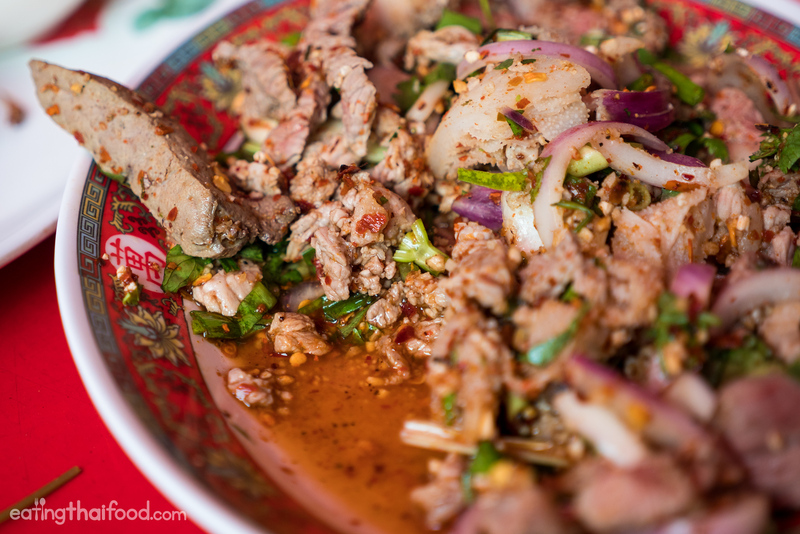 On my last trip I fellin love with som tam puu pla ra and it is one of my favorite dishes. However, in the past few days I have been reading online about the liver cancer/liver fluke parasite epidemic in Isaan. I know this is mostly caused by Koi Plaa. But I have also heard naam pla ra can be problematic and carry liver fluke parasites, depending on how it is made. I was wondering what your input/expertise is on this subject? I love Isaan food, especially som tam pu plaa ra, and would hate to have to avoid eating it on this trip. 1) A type of parasite called Opisthorchis Viverrini are found in raw and partially cooked meat and shellfish. Many medical researches in Thailand found people in the North and North East have the most problem with liver, and stomach cancer caused by these parasites because they have many dishes of raw fresh water shellfish and meat. Several samples of “Pla-ra” were taken from different regions in North and North East by many groups of researchers but they did not find the parasites in them. Although there were other researchers who found the parasites in small samples but these were dead parasites because the process of making Pla-ra involves fermenting it for several months, usually 6 months to one year. The parasites are dead after mixing with salt for 24- 48 hours. So the problem is not with the Pla-ra but with the way food is cooked. Do not eat half cooked fresh water shellfish or meat. Beef usually is OK but Pork was well known in the past for this problem because they were reared at home and were fed with rubbish. 2) Potassium Nitrate use as preservative in meat products like bacon , ham, sausages also used in Pla-ra by some producers to keep the fish texture and kill acteria but traditionally is not used. It is similar to bacon, traditionally only salt is used. This Potassium Nitrate turns into Nitrosamine which is a cancer causing agent. Eating a lot of vegetables with your food is recommended to help reduce the effect of Nitrosamine. Nam Pla is safe to eat. Thai government has done several tests for safety for export to USA. Visited today. The grilled pork collar and chicken wings were indeed delicious – the pork was melt-in-your-mouth and the chicken was very flavoursome all the way to the bone! However I thought the pork laab was seriously under-gunned, lacking that real zesty punch of lime, mint and shallots (and chilli) that are so typical elsewhere; and the blood cockle salad (my absolutely favourite Thai dish!) was also rather disappointing, not least because we got mussels instead of blood cockles, and an excess of chopped lemongrass gave the dish too woody a texture overall. My wife also had the sweetcorn and fruit salad ( a dish that I think is almost too weird for words) and pronounced it a success. In conclusion we enjoyed our experience there and liked the atmosphere, although paying the bill at the end is a slightly chaotic process – as they don’t seem to track your order and so you have to recount your dishes to allow them to tot up your bill. 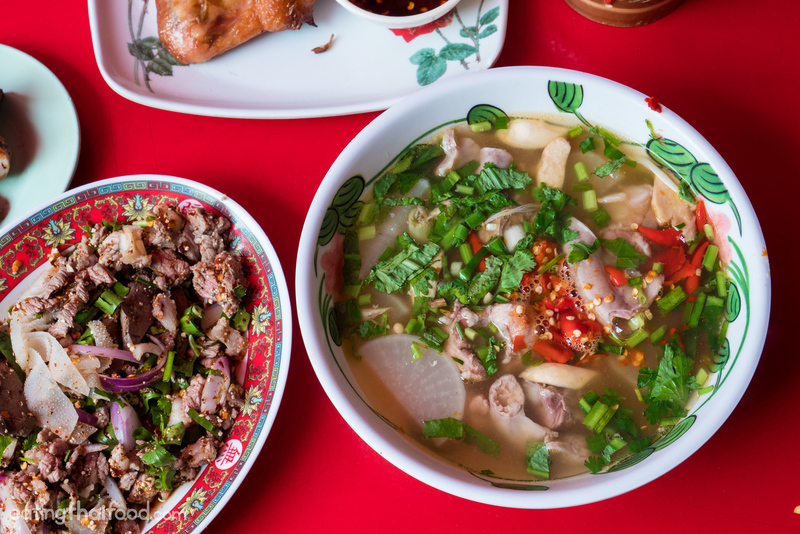 We’d happily go back, but is it the best Isaan food in Bangkok? I’d give a shout out to Tamnak Isaan at Soi 63 Ekkamai – small and certainly not so atmospheric, but the best blood cockle salad I’ve had in Bangkok! My girlfriend and I went here yesterday for our first meal in Bangkok and had an outstanding time! We ordered a ton of stuff and loved everything. Thanks so much for the recommendation! Awesome to hear that Gary, glad you enjoyed it! I have been an avid follower of your reviews and videos. I am in Bkk and the moment and I decided to really track down your recommendations this time. I tried Som Tam Jay So yesterday. It is indeed a little beauty tucked away in the small soi. The soup and the pork neck were out of this world. Very succulent and every bite was like a dream. I have scheduled my self to go and try food at Laab Udon tomorrow. Hey Miraj, awesome to hear from you, glad you were able to try Som Tam Jay So and enjoyed it. Still one of my favorite Isaan restaurants in Bangkok. Enjoy! Great to hear you’ll be coming to Bangkok, hope you enjoy all the food! Next time you’re in the area, you should try Isaan Zab Zab, a small place on Sala Daeng Soi 1 between Siri Sathorn and Seiryu Sushi. I live next door and it’s one of my favorite Isaan places in Bangkok. Hey Manuel, very cool, thanks for the recommendation, will check it out next time I’m in Silom. Excellent presentation! Congrats. My usual hotel in Silom but don’t know Jay So; only tired, old Convent Rd. I’ll certainly try next time. You owe thanks to John Lethlean; I saw his review inc. you in Weekend Australian newspaper. Last year I travelled overland with Viet. mate from Hanoi to Bkk via backblocks Laos &, of course, Isaan. Khon Kaen the focus, but Vientianne as good. All the best for your future. PS: I’m 77yrold. Aussie who’s lived in Bali 40 yrs, 30 of them running a restaurant. Food, glorious food, sambal instead of mustard! Hey Neil, thank you very much, glad you love Thai food as well. Big thanks to John! Yes, I fully agree with you and sambal. Ah, this is the place you took John Lethlean, I think. As per the excellent write-up on you in the Weekend Australian 19 March 2016. Merci Mark pour tes conseils. Je vais tester tes “bons plans” lors de mon prochain voyage. Hi Jean, you’re welcome, thank you for reading. Hi Mark. Many thanks for yet another fascinating eating place to add to our ever increasing list of food destinations. We have travelled to Thailand many times and each time is proving to be an adventure having followed your YouTube channel. Keep up the great work. Looking forward to our next trip with great hunger. Hey Mike, you’re welcome, thank you for reading and following. Glad you enjoy Thai food as well!